The 1820 United States presidential election in Indiana took place between November 1 to December 6, 1820, as part of the 1820 United States presidential election. The state legislature chose three representatives, or electors to the Electoral College, who voted for President and Vice President. 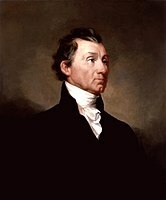 During this election, Indiana cast its three electoral votes to Democratic Republican candidate and incumbent President James Monroe. Effectively, the 1820 presidential election was an election with no campaign, since there was no serious opposition to Monroe and Tompkins. In fact, they won all the electoral votes barring one from New Hampshire, which was cast for Secretary of State John Quincy Adams. This Indiana elections-related article is a stub. You can help Wikipedia by expanding it. This page was last edited on 14 December 2018, at 16:48 (UTC).